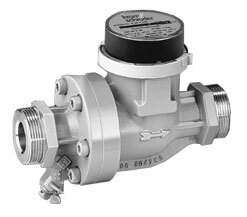 Flow Meters DE and DM are designed to measure volume (DM, DE) and instantaneous flow (DE) of natural gas, propane, inert gases, and air. Typical applications include secondary measurement of volume on industrial installations and test stands including furnaces, kilns, and ovens used in all types of heating processes. The flow meters are ideal for monitoring gas flow rates that aid in optimizing fuel consumption, and providing important troubleshooting information. The total volume is indicated on the mechanical counter head. A remote indicator can be operated with one or two incorporated pulse generators (round plug 3-pin to DIN 41524). Connection: 1″ NPT internal thread; Base capacity: 60-880 CFH; pe max: 175 psig (12 bar). DM 16TN25-120 1″ NPT internal thread 16 60-880 CFH 175 psig (12 bar) Contact Us Not available for online purchase. Connection: 1″ NPT internal thread; Base capacity: 60-880 CFH; pe max: 175 psig (12 bar). DM 25TN25-120 1″ NPT internal thread 25 60-880 CFH 175 psig (12 bar) Contact Us Not available for online purchase. Connection: 1″ NPT internal thread; Base capacity: 75-1500 CFH; pe max: 175 psig (12 bar). DM 40TN25-120 1″ NPT internal thread 40 75-1500 CFH 175 psig (12 bar) Contact Us Not available for online purchase. Connection: 1½″ NPT internal thread; Base capacity: 115-2300 CFH; pe max: 175 psig (12 bar). DM 40TN40-120 1½″ NPT internal thread 40 115-2300 CFH 175 psig (12 bar) Contact Us Not available for online purchase. Connection: 2″ ANSI flanges; Base capacity: 175-3500 CFH; pe max: 175 psig (12 bar). DM 65TW50-120 2″ ANSI flanges 65 175-3500 CFH 175 psig (12 bar) Contact Us Not available for online purchase. Connection: 3″ ANSI flanges; Base capacity: 350-5600 CFH; pe max: 175 psig (12 bar). DM 100TW80-120 3″ ANSI flanges 100 350-5600 CFH 175 psig (12 bar) Contact Us Not available for online purchase. Connection: 3″ ANSI flanges; Base capacity: 440-8800 CFH; pe max: 175 psig (12 bar). DM 160TW80-120 3″ ANSI flanges 160 440-8800 CFH 175 psig (12 bar) Contact Us Not available for online purchase. Connection: 4″ ANSI flanges; Base capacity: 700-14000 CFH; pe max: 175 psig (12 bar). DM 250TW100-120 4″ ANSI flanges 250 700-14000 CFH 175 psig (12 bar) Contact Us Not available for online purchase. Connection: 4″ ANSI flanges; Base capacity: 1150-23000 CFH; pe max: 175 psig (12 bar). DM 400TW100-120 4″ ANSI flanges 400 1150-23000 CFH 175 psig (12 bar) Contact Us Not available for online purchase. Connection: 1″ NPT internal thread; Nominal flow rate: 16; Capacity: 60-880 CFH; pe max: 175 psig (12 bar). Connection: 1″ NPT internal thread; Nominal flow rate: 25; Capacity: 60-880 CFH; pe max: 175 psig (12 bar). Connection: 1″ NPT internal thread; Nominal flow rate: 40; Capacity: 75-1500 CFH; pe max: 175 psig (12 bar). Connection: 1½″ NPT internal thread; Nominal flow rate: 40; Capacity: 115-2300 CFH; pe max: 175 psig (12 bar). Connection: 2″ ANSI flanges; Nominal flow rate: 65; Capacity: 175-3500 CFH; pe max: 175 psig (12 bar). Connection: 3″ ANSI flanges; Nominal flow rate: 100; Capacity: 350-5600 CFH; pe max: 175 psig (12 bar). Connection: 3″ ANSI flanges; Nominal flow rate: 160; Capacity: 440-8800 CFH; pe max: 175 psig (12 bar). Connection: 4″ ANSI flanges; Nominal flow rate: 250; Capacity: 700-14000 CFH; pe max: 175 psig (12 bar). Connection: 4″ ANSI flanges; Nominal flow rate: 400; Capacity: 1150-23000 CFH; pe max: 175 psig (12 bar).